Are There Any Health Dangers With Vaping? What are the dangers of vaping? There is an ongoing debate about the dangers of vaping and how it compares to tobacco smoking. In order to fully appreciate the health benefits of vaping, let’s first look at tobacco smoking. This is where addiction may arise. Since nicotine is a stimulant which has an endpoint, there is the tendency to crave that stimulation when it wanes, hence the beginning of nicotine addiction in some people. Despite its potential for addiction, nicotine itself is relatively harmless – it's the thousands of other chemicals in tobacco smoke that creates tar in the body; causes cancer; pneumonia; emphysema; blackens teeth and destroys the taste buds. An electronic cigarette is a battery-operated device that emits doses of vaporized nicotine, or non-nicotine solutions, for the user to inhale by heating the active components until they turn to vapor (not smoke). With e-cigarettes, an “ e-liquid” which contains water, nicotine, a base and flavorings, substitutes nicotine and is vaporized in a glass or metal chamber which has an electrical current passing through it. This way, it can be heated to a controlled temperature, creating a vapor with minimal combustion, meaning you inhale much less smoke. This process is known as vaping. So what are the dangers of vaping? A recent study from the University of North Carolina found that even in small doses, inhaling the vapor of two primary ingredients found in e-cigarettes—propylene glycol and vegetable glycerin—is likely to expose users to a high level of toxins and that the more ingredients a user inhales, the greater the toxicity. Yet, another study conducted in 2017 by Riccardo Polosa and a group of researchers showed that there were no immediate negative health effects of vaping. That the jury is not yet out on the negative effects of vaping means that the negative health effects are matters of speculation for the time being. When compared to the well known and documented effects of smoking tobacco, it is safe to say that vaping is not as harmful or dangerous as regular cigarettes. In case you are still not sure if vaping is better than tobacco smoking, here are some of the top ten benefits of vaping. One of the major benefits of vaping is the ability to control the amount of nicotine you are ingesting. This is because e-liquids come in a variety of nicotine strengths, ranging all the way from 0mg(nicotine-free) to 36mgs(high-strength) of nicotine: you actually have the option of vaping liquids without nicotine. Vaping allows you to experiment with e-liquid nicotine strength until you are able to find the dose that is just right for you. This way you have full control over your nicotine dosage since you can choose exactly how much nicotine you want in your vape, if you decide to use any at all. 3ml 3ml is the lowest level,best for vapers who are stepping down from higher vape nicotine levels, or those who were only light (less than 10 cigarettes per day) smokers previously. Due to the heavy taxes on tobacco products, your cigarette smoking habit can be quite costly for your health and pocket. Vaping is a far more cost-effective although the costs of vape mods, pen-style vaporizers and other vapes may be more expensive than a single pack of cigarettes. However, in the long run, the cost of vaping is reduced to just a fraction of the cost of traditional tobacco smoking because vapes come with rechargeable batteries, so your only costs will be new coil heads and the e-liquids which last for months can be gotten at affordable prices. If you are a heavy cigarette smoker, you can save hundreds of dollars a year by switching from smoking packs of cigarettes multiple times a week to expending one bottle of vape liquid or similar monthly. There is some stigma associated with smoking the tobacco plant. In some societies, it is seen is as a vice with many laws and legal restrictions against it. This is not the same with e-cigarettes. Electronic cigarettes are lighter and more pleas-ant. They are not as offensive as tobacco cigarettes so people tend to tolerate them better. Moreover, the negative aspects of cigarettes can also have an influence your social and dating life negatively. Smoking tobacco can be considered rude, irresponsible, and intrusive, especially indoors and near non-smokers because it is harmful to even persons who do not smoke but are around the smokers. The plethora of e-fluid flavors that are available to the vaper is one of the resons why vaping is so appealing to a lot of people. Imagine choosing from flavours like apple, strawberry, caramel, menthol, cherry and chocolate just to name a few. Beyond that, these interesting flavours are critical for quitting smoking as ex-smokers have been known to report that finding an alternative flavour that they liked helped them switch completely. Moreover, after using flavours that do not resemble tobacco smoke for a few months, most people who smoke cigarettes do not feel like going back to tobacco smoke because of the terrible taste. The various tars, oils, and products that are contained in the cigarette smoke gives off an ashy smell that lingers on your breath and clothes. Vaping uses different fascinating flavors and scents which make the experience more pleasurable for everyone around. Besides, the emissions are minimally invasive and they pose no health threat to bystanders. This is not to say that there are places where vaping might be obtrusive like restaurants, public transportation, enclosed spaces, and formal meetings. The point is that e-cigarettes smell better than cigarette smoke is less likely to offend people in bars, offices, and many other spaces where vaping might be allowed. The ingredients in e-liquid PG, VG and food grade flavors are FDA approved and are considered low risk just as smoke-free nicotine from smokeless tobacco. So it is safe to say that the risk from vaping is low going by the experiences of thousands of veteran vapers and various academic investigation of the effects of vaping. The academic investigations in particular, show that e-cigarettes are harmless in the short run. Although these risks exist, there are in the same range as those associated with everyday risks, like transporting from place to place, eating junk food or binge drinking which we take regularly. E-cigarettes are less addictive than cigarettes. Numerous ex-smokers have been able to change to vaping and regularly continue vaping in light of the fact that they like it, yet feel they could stop whenever they needed. Most experienced vapers have been known to report that they they take it or leave it, or at least abstain for long periods while considerably reducing their aggregate nicotine consumption. Vaping is a convenient habit that you can indulge in because of its social acceptance. Since it is not as offensive or intrusive as cigarettes, it is convenient to vape in places where cigarettes would be seen as a unacceptable. This is because of its minimal aesthetic impact and lack of health impact on bystanders. Its convenience is belied by the fact that vapers have the option of quickly pulling out an e-cigarette and taking one or two puffs – delivering only as much nicotine as is desired at the moment, rather than having to light and smoke a whole cigarette. In addition, not having to step outside of one’s office or a bar to vape is another indication of the convenience of e-cigarettes. Vaping helps you relax and fight stress although most times the stress is caused by the lack of vaping in the first place. For example, when you have a certain addiction with strong cravings that you do not satisfy, aggravation sets in because your body starts to rely on it. Since vaping is mostly used as a substitute for smoking, whenever the craving for a cigarette arises, vaping offers a certain relaxation and sense of serenity to the body and mind of the vaper. Liked we noted earlier on the list, the convenience factor is high with vaping because you can silence your cravings for a vaping experience. Although advanced some vapes devices may require the initial tinkering that is a handful for the greenhorn, a lot of these vape devices come prefilled and are ready for immediate use.Once the device is primed for use, taking a hit is as simple as pushing a button or drawing on the device. Better still a fully charged vape device only needs e-juice to continue working. In fact, the average vape can sustain you throughout the day without maintenance or upkeep. With vapes, satisfaction is just an arm length away. 1.Are E-cigarettes safer than smoking? Yes. This position is based on the opinions of experts who think that e-cigarettes are safer than smoking tobacco. Since vaping has not been associated with serious health risks, it is safe to say that the dangers of vaping are minimal. Conversely, cigarette smoking is associated with a high number of very serious health risks to both the smoker and to others around them. E-cigarettes do not produce tar and carbon monoxide (two of the main toxins in conventional cigarette smoke), so switching from traditional tobacco to e-cigarettes reduces these health risks. 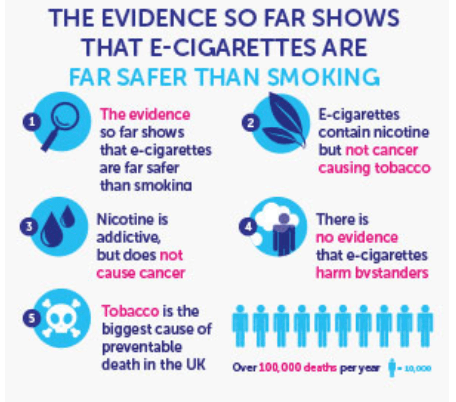 Although the vapour from e-cigarettes contain potentially harmful chemicals that are also found in cigarette smoke, the risks are much, much lower. It is essentially a case of choosing the lesser of two evils. No, it is not. Nicotine in itself is not responsible for smoking-related diseases, such as cancers and heart disease. It is the other chemicals present in cigarettes that cause these diseases. Lung cancer is caused by the direct exposure of the lungs to the carcinogens in tobacco smoke. Chronic obstructive pulmonary disease (COPD) is caused by the irritant effects of smoke while cardiovascular disease stems from the effects of smoke on blood vessel walls. However, while pure nicotine is a toxic compound that should be handled with caution, nicotine from tobacco, nicotine replacement therapies and e-liquids is consumed by millions of people per day, and no reports of these diseases as a direct result of the consumption of these forms of nicotine. 3.Is it ok to smoke and vape at the same time? Although there is no empirical evidence to show that vaping and smoking at the same time is bad for the health, you should always strive to stop smoking traditional tobacco. Dual usage can reduce the impacts of tobacco cigarettes on one’s health if smoking is reduced considerably. Switching over from tobacco cigarettes to e-cigarette is not as easy as non-smokers can image. One must go through a tough transition period, but the dual usage can make a real difference. Vaping and smoking at the same time for as long as the transition period last, will help you recover faster from the smoking addiction, so dual usage is certainly a common step to go through until you achieve the final goal. 4.How should I use e-cig to quit smoking? E-cigarettes can help you manage your nicotine cravings. If you are determined, quitting smoking using e-cigarettes is really easy, and is literally a process of weaning yourself away from the nicotine addiction by combating the physical addiction to the nicotine drug addiction at the same time. This is easier said than done but is still an attainable goal. Start by using an e-cigarette for a while. Use a combination of vaping device, flavors of e-liquid and nicotine strength that suits you. Then you gradually drop the nicotine level until you wean yourself of your dependence on it. Smoking cigarettes while using a vape device is expected but you should strive to reduce them too. 5.Will e-cigrette be cheaper for me than smoking? The initial cost of buying a vaping device will be higher than buying a pack of smokes, but it will save you money in the long run. Even when you factor in the costs of e-liquids and the potential replacement of coils or pods, these costs still trump buying packs of cigarettes in the long run. Consider your first vape device an investment which is only expected to bring returns in the future. Although there are outlier cases where vaping can cost more than smoking, when you buy e-juices in larger quantity sizes (to save you money that come with discounts) or switch to nicotine salt e-liquids, having an e-cigrette will definitely become cheaper for you. Although not everyone is into cloud chasing, one of the attractions of vaping is the ability to create huge clouds of vapor. Obviously the first thing you need for you to blow smoke rings is a vaping device. The second thing you need is a nice, calm environment because moving air will disrupt the fragile vapor, while still air will allow a smoke ring to grow to its full glory and linger for a while afterwards. Now that you have settled all of that, you are ready to blow smoke rings.